(AP) -- A pair of spacewalking astronauts overpowered a stubborn bolt and successfully installed a new piano-sized camera in the Hubble Space Telescope on Thursday, the first step to making the observatory better than ever. "Let there be light," spacewalker John Grunsfeld said as ground controllers checked the power hookups. Grunsfeld and Andrew Feustel also completed other major chores, replacing a science data-handling unit that broke last fall and hooking up a docking ring so a robotic craft can guide Hubble into the Pacific years from now. The repair job - all the more dangerous because of the high, debris-ridden orbit - got off to a slow and rocky start. John Grunsfeld and Andrew Feustel had trouble removing the old camera from the telescope because a bolt was stuck. They fetched extra tools, but none seemed to work. Finally, Mission Control urged the astronauts to use as much force as possible, even though there was a risk the bolt might break. If that had happened, the old camera would be stuck inside, leaving no room for its souped-up replacement. The extra effort paid off but put the astronauts a little behind schedule in their first spacewalk of shuttle Atlantis' mission. In all, five high-risk spacewalks are planned to fix Hubble's broken parts and plug in higher-tech science instruments. "This has been in there for 16 years, Drew," said Grunsfeld, "and it didn't want to come out." 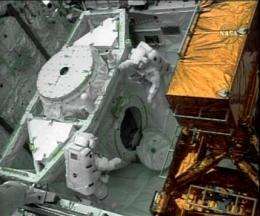 The spacewalkers followed up with the installation of the replacement camera. From inside Atlantis, spacewalk overseer Michael Massimino congratulated Grunsfeld and Feustel for "adjusting to the curve ball that was thrown at you." The newly inserted wide-field and planetary camera - worth $132 million - will allow astronomers to peer deeper into the universe, to within 500 million to 600 million years of creation. The camera - which has taken more than 135,000 observations - is destined for the Smithsonian Institution. Massimino was corrected when he said it was awesome to get the new wide-field camera in "to unlock the secrets of the universe." "More of the secrets," responded Grunsfeld, an astrophysicist. Grunsfeld, the chief repairman with two previous Hubble missions under his work belt, took the lead on the camera and data-handling device replacements. He sounded awe-struck as ever. "Ah, this is fantastic," he said as he floated outside, the bus-size telescope looming overhead. Hubble's original data handler, which was launched with the telescope 19 years ago, failed in September, just two weeks before Atlantis was supposed to take off on this fifth and final servicing mission. The breakdown caused all picture-taking to cease and prompted NASA to postpone the shuttle flight. I fail to understand how this orbit can be life threatening to the astronauts, while NASA seems to have kept, and intends to keep Hubble in the same orbit for the next (up to) 10 years. If there is any chance of a single astronaut being hit in the few hours it takes, then what would the chances be for a bus sized object spending thousands of times as long in the same orbit? I don't get it, i thought they were supposed to retire hubble years ago.. Excellent work in the hazards of space! I'm not complaining, as the replacement won't be up for several more years. Go Hubble!